On Friday morning, pressed for time and to avoid the rain, I did speed intervals on my indoor trainer. With 5 seconds to go in the final effort, the trainer gave up the ghost and left me spinning wheels without resistance. My CycleOps Fluid trainer was an old one. From 1998. It was, in fact, a pre-production prototype from when I worked for the company. So I knew the design flaws and the weak points. And I knew it was just a matter of time before it would fail. I was never a big fan of indoor trainers, especially after working countless trade shows and dealer events at CycleOps. But I had reprised it for its practicality and efficiency, whether it be an urban pre-race warm-up or a workout squeezed into the dark pre-dawn. Farewell. Time for a replacement. The kit is “one of a kind”, custom fabbed by Champion Systems. I created the design, developed the logo, did all the artwork. I have a limited run of shorts and jersey that I’ve shared with a select few. 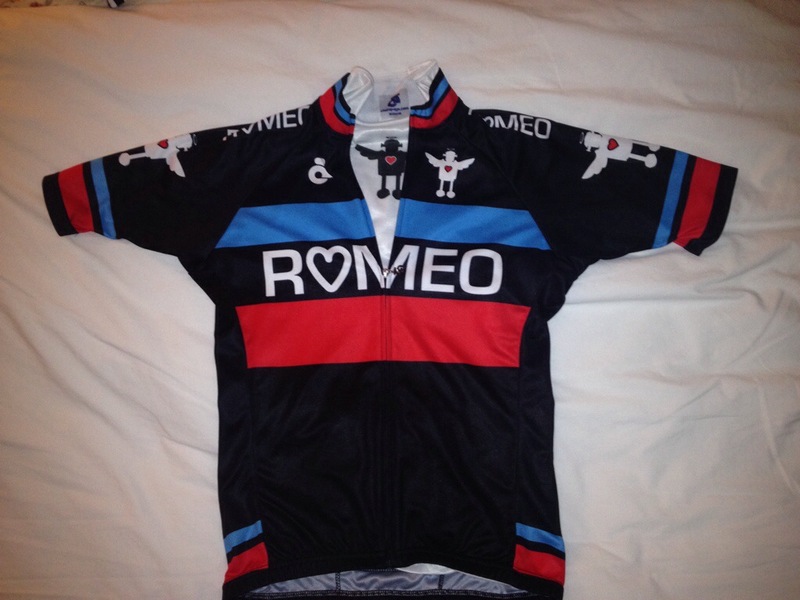 I train and race in this jersey, under Team Romeo. “Romeo” is an homage and memorial to my little boy, Romeo, who died as a infant. He would be 9 1/2 years old now. Cycling is one of the things that has helped me live with his loss. For me, grieving has been about externalizing it — so I literally wear it on my sleeves with this clothing. It describes my own suffering — on and off the bike — in a way that feels clean and productive. “Romeo” was also often found on cycling jerseys of the 60’s under the Belgian team Flandria-Romeo, so there is also a nod to the heritage of the sport. With less than six weeks to go until Marathon Monday I got some new tread. 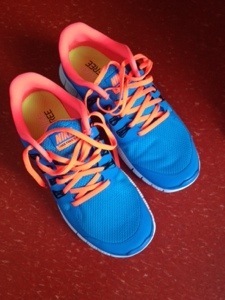 I’d pretty much worn through my previous pair of Nike Free 5.0 and now wasn’t the time to switch shoe styles. They will never be this bright again. I picked up a new ride at the start of the season: a LOOK 695 SR. It took me a while to get to write about it, I’ve been enjoying it so much. I was down in Austin riding with my friend. This was his “spare” bike. It was a perfect fit, he wanted to sell it and the price was right. I couldn’t say no. The frame is full-carbon with an integrated seat post. Look brands this frame ‘SR’ for ‘super-rigid’. The ride quality has been superb: taut, responsive, comfortable. The handling is crisp. It feels like flying a jet fighter — not that I have any experience doing that. The power transfer is solid, with little noticeable flex and most of that coming from the drivetrain and wheels. It’s a beautiful looking frame, too — red and white graphics laid over luscious carbon weave. I’ve spent a fair amount of time truing up my wheels over the past few days. 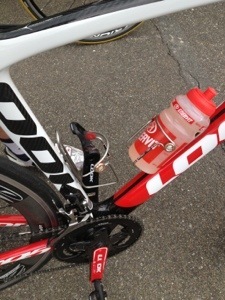 Zipp 404’s. Handbuilt DT’s. It had been a while since I had to do this. I rode a pair of Campagnolo Neutrons for 10 years and never had to touch them. Years ago, I worked in a bike shop and built wheels. Hundreds of them. It took a lot of time to get the final tension and truing just right. And I always felt rushed to get them done. I have more patience now. On Tuesday, before the Tuesday Night World Championships had even started, I was already in the big ring.